For other uses, see Basalt (disambiguation). Basalt ( US: /bəˈsɔːlt, ˈbeɪsɒlt/ , UK: /ˈbæsɔːlt, ˈbæsəlt/ )     is a mafic extrusive igneous rock formed from the rapid cooling of magnesium-rich and iron-rich lava  exposed at or very near the surface of a terrestrial planet or a moon. More than 90% of all volcanic rock on Earth is basalt. 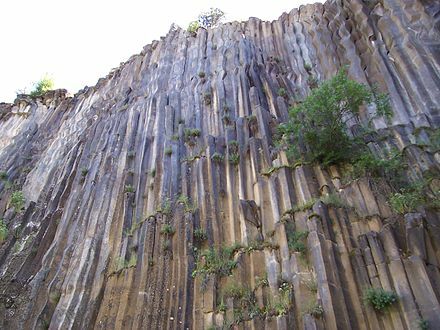 Basalt lava has a low viscosity, due to its low silica content, resulting in rapid lava flows that can spread over great areas before cooling and solidification. Flood basalt describes the formation in a series of lava basalt flows. Mafic is an adjective describing a silicate mineral or igneous rock that is rich in magnesium and iron, and is thus a portmanteau of magnesium and ferric. Most mafic minerals are dark in color, and common rock-forming mafic minerals include olivine, pyroxene, amphibole, and biotite. Common mafic rocks include basalt, diabase and gabbro. Mafic rocks often also contain calcium-rich varieties of plagioclase feldspar. By definition, basalt is an aphanitic (fine-grained) igneous rock with generally 45–53% silica (SiO2)  and less than 10% feldspathoid by volume, and where at least 65% of the rock is feldspar in the form of plagioclase. This is as per definition of the International Union of Geological Sciences (IUGS) classification scheme. It is the most common volcanic rock type on Earth, being a key component of oceanic crust as well as the principal volcanic rock in many mid-oceanic islands, including Iceland, the Faroe Islands, Réunion and the islands of Hawaiʻi. 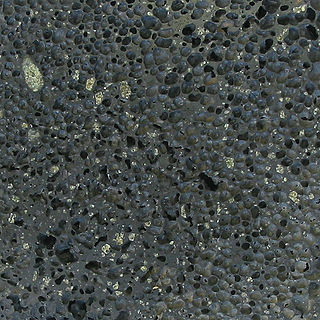 Basalt commonly features a very fine-grained or glassy matrix interspersed with visible mineral grains. The average density is 3.0 g/cm3. 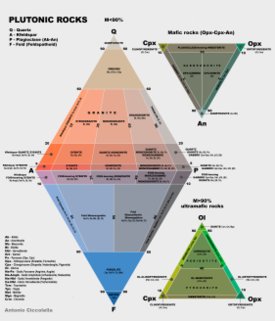 A QAPF diagram is a double ternary diagram which is used to classify igneous rocks based on mineralogic composition. The acronym, QAPF, stands for "Quartz, Alkali feldspar, Plagioclase, Feldspathoid (Foid)". These are the mineral groups used for classification in QAPF diagram. Q, A, P and F percentages are normalized. The feldspathoids are a group of tectosilicate minerals which resemble feldspars but have a different structure and much lower silica content. They occur in rare and unusual types of igneous rocks, and are not found in rocks containing primary quartz. Basalt is defined by its mineral content and texture, and physical descriptions without mineralogical context may be unreliable in some circumstances. Basalt is usually grey to black in colour, but rapidly weathers to brown or rust-red due to oxidation of its mafic (iron-rich) minerals into hematite and other iron oxides and hydroxides. 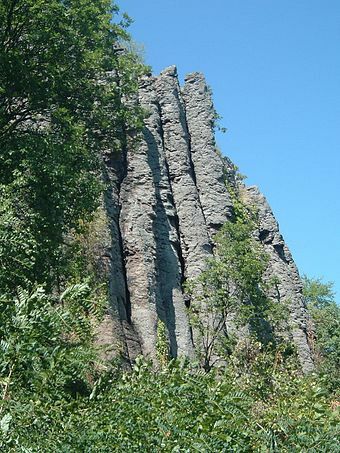 Although usually characterized as "dark", basaltic rocks exhibit a wide range of shading due to regional geochemical processes. Due to weathering or high concentrations of plagioclase, some basalts can be quite light-coloured, superficially resembling andesite to untrained eyes. Basalt has a fine-grained mineral texture due to the molten rock cooling too quickly for large mineral crystals to grow; it is often porphyritic, containing larger crystals (phenocrysts) formed prior to the extrusion that brought the magma to the surface, embedded in a finer-grained matrix. These phenocrysts usually are of olivine or a calcium-rich plagioclase, which have the highest melting temperatures of the typical minerals that can crystallize from the melt. Igneous textures include the rock textures occurring in igneous rocks. Igneous textures are used by geologists in determining the mode of origin igneous rocks and are used in rock classification. There are six main types of textures; phaneritic, aphanitic, porphyritic, glassy, pyroclastic and pegmatitic. Hematite, also spelled as haematite, is the mineral form of iron(III) oxide (Fe2O3), one of several iron oxides. It is the oldest known iron oxide mineral that has ever formed on Earth, and is widespread in rocks and soils. Hematite crystallizes in the rhombohedral lattice system, and it has the same crystal structure as ilmenite and corundum. Hematite and ilmenite form a complete solid solution at temperatures above 950 °C (1,740 °F). Basalt with a vesicular texture is called vesicular basalt, when the bulk of the rock is mostly solid; when the vesicles are over half the volume of a specimen, it is called scoria. This texture forms when dissolved gases come out of solution and form bubbles as the magma decompresses as it reaches the surface, yet are trapped as the erupted lava hardens before the gases can escape. Scoria is a highly vesicular, dark colored volcanic rock that may or may not contain crystals (phenocrysts). It is typically dark in color, and basaltic or andesitic in composition. Scoria is relatively low in density as a result of its numerous macroscopic ellipsoidal vesicles, but in contrast to pumice, all scoria has a specific gravity greater than 1, and sinks in water. The holes or vesicles form when gases that were dissolved in the magma come out of solution as it erupts, creating bubbles in the molten rock, some of which are frozen in place as the rock cools and solidifies. Scoria may form as part of a lava flow, typically near its surface, or as fragmental ejecta, for instance in Strombolian eruptions that form steep-sided scoria cones. Most scoria is composed of glassy fragments, and may contain phenocrysts. The word scoria comes from the Greek σκωρία, skōria, rust. A colloquial term for scoria is cinder. The term basalt is at times applied to shallow intrusive rocks with a composition typical of basalt, but rocks of this composition with a phaneritic (coarser) groundmass are generally referred to as diabase (also called dolerite) or, when more coarse-grained (crystals over 2 mm across), as gabbro. Gabbro is often marketed commercially as "black granite." Diabase or dolerite or microgabbro is a mafic, holocrystalline, subvolcanic rock equivalent to volcanic basalt or plutonic gabbro. Diabase dikes and sills are typically shallow intrusive bodies and often exhibit fine grained to aphanitic chilled margins which may contain tachylite. Diabase is the preferred name in North America, yet dolerite is the preferred name in most of the rest of the world, where sometimes the name diabase is applied to altered dolerites and basalts. Many petrologists prefer the name microgabbro to avoid this confusion. 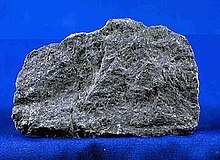 Gabbro is a phaneritic (coarse-grained), mafic intrusive igneous rock formed from the slow cooling of magnesium-rich and iron-rich magma into a holocrystalline mass deep beneath the Earth's surface. Slow-cooling, coarse-grained gabbro is chemically equivalent to rapid-cooling, fine-grained basalt. Much of the Earth's oceanic crust is made of gabbro, formed at mid-ocean ridges. Gabbro is also found as plutons associated with continental volcanism. Due to its variant nature, the term "gabbro" may be applied loosely to a wide range of intrusive rocks, many of which are merely "gabbroic". In the Hadean, Archean, and early Proterozoic eras of Earth's history, the chemistry of erupted magmas was significantly different from today's, due to immature crustal and asthenosphere differentiation. These ultramafic volcanic rocks, with silica (SiO2) contents below 45% are usually classified as komatiites. The Hadean is a geologic eon of the Earth pre-dating the Archean. It began with the formation of the Earth about 4.6 billion years ago and ended, as defined by the ICS, 4 billion years ago. As of 2016, the ICS describes its status as "informal". Geologist Preston Cloud coined the term in 1972, originally to label the period before the earliest-known rocks on Earth. W. Brian Harland later coined an almost synonymous term, the "Priscoan period", from priscus, the Latin word for "ancient". Other, older texts refer to the eon as the Pre-Archean. The Archean Eon is one of the four geologic eons of Earth history, occurring 4,000 to 2,500 million years ago. During the Archean, the Earth's crust had cooled enough to allow the formation of continents and life started to form. The Proterozoic is a geological eon spanning the time from the appearance of oxygen in Earth's atmosphere to just before the proliferation of complex life on the Earth. The name Proterozoic combines the two forms of ultimately Greek origin: protero- meaning "former, earlier", and -zoic, a suffix related to zoe "life". The Proterozoic Eon extended from 2500 mya to 541 mya, and is the most recent part of the Precambrian "supereon". The Proterozoic is the longest eon of the Earth's geologic time scale and it is subdivided into three geologic eras : the Paleoproterozoic, Mesoproterozoic, and Neoproterozoic. Tholeiitic basalt is relatively rich in silica and poor in sodium. 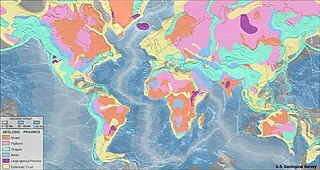 Included in this category are most basalts of the ocean floor, most large oceanic islands, and continental flood basalts such as the Columbia River Plateau. High-alumina basalt may be silica-undersaturated or -oversaturated (see normative mineralogy). It has greater than 17% alumina (Al2O3) and is intermediate in composition between tholeiitic basalt and alkali basalt; the relatively alumina-rich composition is based on rocks without phenocrysts of plagioclase. Alkali basalt is relatively poor in silica and rich in sodium. It is silica-undersaturated and may contain feldspathoids, alkali feldspar and phlogopite. Boninite is a high-magnesium form of basalt[ citation needed ] that is erupted generally in back-arc basins, distinguished by its low titanium content and trace-element composition. 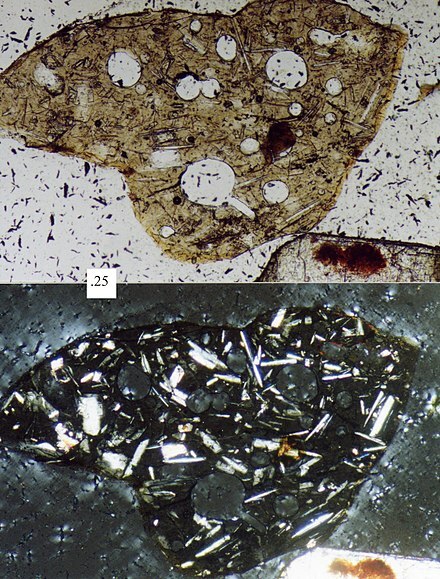 Photomicrograph of a volcanic (basaltic) sand grain; upper picture is plane-polarized light, bottom picture is cross-polarized light, scale box at left-center is 0.25 millimeter. Note white plagioclase "microlites" in cross-polarized light picture, surrounded by very fine grained volcanic glass. The mineralogy of basalt is characterized by a preponderance of calcic plagioclase feldspar and pyroxene. Olivine can also be a significant constituent. Accessory minerals present in relatively minor amounts include iron oxides and iron-titanium oxides, such as magnetite, ulvospinel, and ilmenite. Because of the presence of such oxide minerals, basalt can acquire strong magnetic signatures as it cools, and paleomagnetic studies have made extensive use of basalt. In tholeiitic basalt, pyroxene (augite and orthopyroxene or pigeonite) and calcium-rich plagioclase are common phenocryst minerals. Olivine may also be a phenocryst, and when present, may have rims of pigeonite. The groundmass contains interstitial quartz or tridymite or cristobalite. Olivine tholeiitic basalt has augite and orthopyroxene or pigeonite with abundant olivine, but olivine may have rims of pyroxene and is unlikely to be present in the groundmass. Ocean floor basalts, erupted originally at mid-ocean ridges, are known as MORB (mid-ocean ridge basalt) and are characteristically low in incompatible elements. Alkali basalts typically have mineral assemblages that lack orthopyroxene but contain olivine. Feldspar phenocrysts typically are labradorite to andesine in composition. Augite is rich in titanium compared to augite in tholeiitic basalt. Minerals such as alkali feldspar, leucite, nepheline, sodalite, phlogopite mica, and apatite may be present in the groundmass. Basalt has high liquidus and solidus temperatures—values at the Earth's surface are near or above 1200 °C (liquidus) and near or below 1000 °C (solidus); these values are higher than those of other common igneous rocks. Relative to most common igneous rocks, basalt compositions are rich in MgO and CaO and low in SiO2 and the alkali oxides, i.e., Na2O + K2O, consistent with the TAS classification. High-alumina basalts have aluminium contents of 17–19 wt% Al2O3; boninites have magnesium (MgO) contents of up to 15 percent. Rare feldspathoid-rich mafic rocks, akin to alkali basalts, may have Na2O + K2O contents of 12% or more. The abundances of the lanthanide or rare-earth elements (REE) can be a useful diagnostic tool to help explain the history of mineral crystallisation as the melt cooled. In particular, the relative abundance of europium compared to the other REE is often markedly higher or lower, and called the europium anomaly. It arises because Eu2+ can substitute for Ca2+ in plagioclase feldspar, unlike any of the other lanthanides, which tend to only form 3+ cations. Mid-ocean ridge basalts (MORB) and their intrusive equivalents, gabbros, are the characteristic igneous rocks formed at mid-ocean ridges. They are tholeiitic basalts particularly low in total alkalis and in incompatible trace elements, and they have relatively flat rare earth element (REE) patterns normalized to mantle or chondrite values. In contrast, alkali basalts have normalized patterns highly enriched in the light REE, and with greater abundances of the REE and of other incompatible elements. Because MORB basalt is considered a key to understanding plate tectonics, its compositions have been much studied. Although MORB compositions are distinctive relative to average compositions of basalts erupted in other environments, they are not uniform. For instance, compositions change with position along the Mid-Atlantic ridge, and the compositions also define different ranges in different ocean basins. Mid-ocean ridge basalts have been subdivided into varieties such as normal (NMORB) and those slightly more enriched in incompatible elements (EMORB). Isotope ratios of elements such as strontium, neodymium, lead, hafnium, and osmium in basalts have been much studied to learn about the evolution of the Earth's mantle. Isotopic ratios of noble gases, such as 3 He/4He, are also of great value: for instance, ratios for basalts range from 6 to 10 for mid-ocean ridge tholeiitic basalt (normalized to atmospheric values), but to 15–24 and more for ocean-island basalts thought to be derived from mantle plumes. Source rocks for the partial melts probably include both peridotite and pyroxenite (e.g., Sobolev et al., 2007). The shape, structure and texture of a basalt is diagnostic of how and where it erupted—whether into the sea, in an explosive cinder eruption or as creeping pāhoehoe lava flows, the classic image of Hawaiian basalt eruptions. Basalt that erupts under open air (that is, subaerially) forms three distinct types of lava or volcanic deposits: scoria; ash or cinder (breccia); and lava flows. Basalt in the tops of subaerial lava flows and cinder cones will often be highly vesiculated, imparting a lightweight "frothy" texture to the rock. Basaltic cinders are often red, coloured by oxidized iron from weathered iron-rich minerals such as pyroxene. ʻAʻā types of blocky, cinder and breccia flows of thick, viscous basaltic lava are common in Hawaiʻi. Pāhoehoe is a highly fluid, hot form of basalt which tends to form thin aprons of molten lava which fill up hollows and sometimes forms lava lakes. Lava tubes are common features of pāhoehoe eruptions. Basaltic tuff or pyroclastic rocks are rare but not unknown. Usually basalt is too hot and fluid to build up sufficient pressure to form explosive lava eruptions but occasionally this will happen by trapping of the lava within the volcanic throat and buildup of volcanic gases. Hawaiʻi's Mauna Loa volcano erupted in this way in the 19th century, as did Mount Tarawera, New Zealand in its violent 1886 eruption. Maar volcanoes are typical of small basalt tuffs, formed by explosive eruption of basalt through the crust, forming an apron of mixed basalt and wall rock breccia and a fan of basalt tuff further out from the volcano. Amygdaloidal structure is common in relict vesicles and beautifully crystallized species of zeolites, quartz or calcite are frequently found. During the cooling of a thick lava flow, contractional joints or fractures form. If a flow cools relatively rapidly, significant contraction forces build up. While a flow can shrink in the vertical dimension without fracturing, it can't easily accommodate shrinking in the horizontal direction unless cracks form; the extensive fracture network that develops results in the formation of columns. The topology of the lateral shapes of these columns can broadly be classed as a random cellular network. These structures are predominantly hexagonal in cross-section, but polygons with three to twelve or more sides can be observed. The size of the columns depends loosely on the rate of cooling; very rapid cooling may result in very small (<1 cm diameter) columns, while slow cooling is more likely to produce large columns. When basalt erupts underwater or flows into the sea, contact with the water quenches the surface and the lava forms a distinctive pillow shape, through which the hot lava breaks to form another pillow. This "pillow" texture is very common in underwater basaltic flows and is diagnostic of an underwater eruption environment when found in ancient rocks. Pillows typically consist of a fine-grained core with a glassy crust and have radial jointing. The size of individual pillows varies from 10 cm up to several meters. When pāhoehoe lava enters the sea it usually forms pillow basalts. However, when ʻaʻā enters the ocean it forms a littoral cone, a small cone-shaped accumulation of tuffaceous debris formed when the blocky ʻaʻā lava enters the water and explodes from built-up steam. The island of Surtsey in the Atlantic Ocean is a basalt volcano which breached the ocean surface in 1963. The initial phase of Surtsey's eruption was highly explosive, as the magma was quite fluid, causing the rock to be blown apart by the boiling steam to form a tuff and cinder cone. This has subsequently moved to a typical pāhoehoe-type behaviour. Volcanic glass may be present, particularly as rinds on rapidly chilled surfaces of lava flows, and is commonly (but not exclusively) associated with underwater eruptions. Pillow basalt is also produced by some subglacial volcanic eruptions. The common corrosion features of underwater volcanic basalt suggest that microbial activity may play a significant role in the chemical exchange between basaltic rocks and seawater. The significant amounts of reduced iron, Fe(II), and manganese, Mn(II), present in basaltic rocks provide potential energy sources for bacteria. Some Fe(II)-oxidizing bacteria cultured from iron-sulfide surfaces are also able to grow with basaltic rock as a source of Fe(II). Fe- and Mn- oxidizing bacteria have been cultured from weathered submarine basalts of Loihi Seamount. The impact of bacteria on altering the chemical composition of basaltic glass (and thus, the oceanic crust) and seawater suggest that these interactions may lead to an application of hydrothermal vents to the origin of life. On Earth, most basalt magmas have formed by decompression melting of the mantle. Basalt commonly erupts on Io (the third largest moon of Jupiter),  and has also formed on the Moon, Mars, Venus, and the asteroid Vesta. The crustal portions of oceanic tectonic plates are composed predominantly of basalt, produced from upwelling mantle below, the ocean ridges. 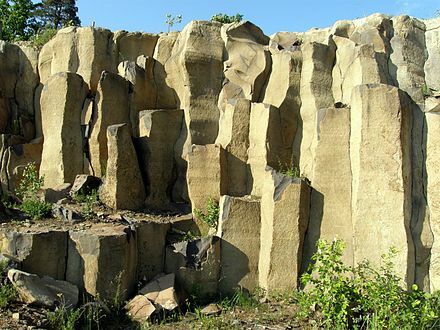 Basalt is one of the most common rock types in the world. Basalt is the rock most typical of large igneous provinces. 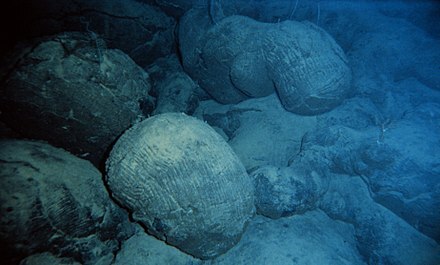 The largest occurrences of basalt are in the ocean floor that is almost completely made up by basalt. Above sea level basalt is common in hotspot islands and around volcanic arcs, specially those on thin crust. However, the largest volumes of basalt on land correspond to continental flood basalts. Continental flood basalts are known to exist in the Deccan Traps in India, the Chilcotin Group in British Columbia, Canada, the Paraná Traps in Brazil, the Siberian Traps in Russia, the Karoo flood basalt province in South Africa, the Columbia River Plateau of Washington and Oregon. Many archipelagoes and island nations have an overwhelming majority of their exposed bedrock made up of basalt due to being above hotspots, for example, Iceland and Hawaiʻi. Ancient Precambrian basalts are usually only found in fold and thrust belts, and are often heavily metamorphosed. These are known as greenstone belts, because low-grade metamorphism of basalt produces chlorite, actinolite, epidote and other green minerals. Lunar olivine basalt collected by Apollo 15. The dark areas visible on Earth's moon, the lunar maria, are plains of flood basaltic lava flows. 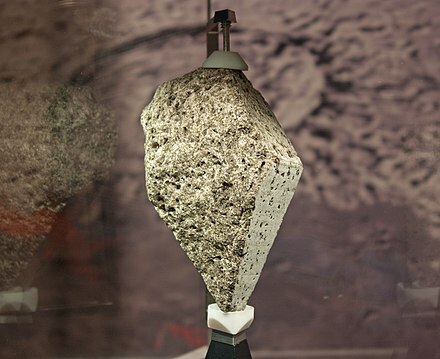 These rocks were sampled by the manned American Apollo program, the robotic Russian Luna program, and are represented among the lunar meteorites. Lunar basalts show exotic textures and mineralogy, particularly shock metamorphism, lack of the oxidation typical of terrestrial basalts, and a complete lack of hydration. Most of the Moon's basalts erupted between about 3 and 3.5 billion years ago, but the oldest samples are 4.2 billion years old, and the youngest flows, based on the age dating method of crater counting, are estimated to have erupted only 1.2 billion years ago. Basalt is also a common rock on the surface of Mars, as determined by data sent back from the planet's surface,  and by Martian meteorites. Basalts are important rocks within metamorphic belts, as they can provide vital information on the conditions of metamorphism within the belt. Metamorphosed basalts are important hosts for a variety of hydrothermal ore deposits, including gold deposits, copper deposits, volcanogenic massive sulfide ore deposits and others. Compared to other rocks found on Earth's surface, basalts weather relatively fast. The typically iron-rich minerals oxidise rapidly in water and air, staining the rock a brown to red colour due to iron oxide (rust). Chemical weathering also releases readily water-soluble cations such as calcium, sodium and magnesium, which give basaltic areas a strong buffer capacity against acidification. Calcium released by basalts binds up CO2 from the atmosphere forming CaCO3 acting thus as a CO2 trap. To this it must be added that the eruption of basalt itself is often associated with the release of large quantities of CO2 into the atmosphere from volcanic gases. Wikimedia Commons has media related to Basalt . Volcanism is the phenomenon of eruption of molten rock (magma) onto the surface of the Earth or a solid-surface planet or moon, where lava, pyroclastics and volcanic gases erupt through a break in the surface called a vent. It includes all phenomena resulting from and causing magma within the crust or mantle of the body, to rise through the crust and form volcanic rocks on the surface. Dacite is an igneous, volcanic rock. It has an aphanitic to porphyritic texture and is intermediate in composition between andesite and rhyolite. The word dacite comes from Dacia, a province of the Roman Empire which lay between the Danube River and Carpathian Mountains where the rock was first described. Volcanic rock is a rock formed from magma erupted from a volcano. In other words, it differs from other igneous rock by being of volcanic origin. Like all rock types, the concept of volcanic rock is artificial, and in nature volcanic rocks grade into hypabyssal and metamorphic rocks and constitute an important element of some sediments and sedimentary rocks. For these reasons, in geology, volcanics and shallow hypabyssal rocks are not always treated as distinct. In the context of Precambrian shield geology, the term "volcanic" is often applied to what are strictly metavolcanic rocks. Volcanic rocks and sediment that form from magma erupted into the air are called "volcaniclastics," and these are technically sedimentary rocks. A flood basalt is the result of a giant volcanic eruption or series of eruptions that covers large stretches of land or the ocean floor with basalt lava. Flood basalt provinces such as the Deccan Traps of India are often called traps, after the Swedish word trappa, due to the characteristic stairstep geomorphology of many associated landscapes. Michael R. Rampino and Richard Stothers (1988) cited eleven distinct flood basalt episodes occurring in the past 250 million years, creating large volcanic provinces, plateaus, and mountain ranges. However, more have been recognized such as the large Ontong Java Plateau, and the Chilcotin Group, though the latter may be linked to the Columbia River Basalt Group. Large igneous provinces have been connected to five mass extinction events, and may be associated with bolide impacts. Essexite, also called nepheline monzogabbro, is a dark gray or black holocrystalline plutonic igneous rock. Its name is derived from the type locality in Essex County, Massachusetts, in the United States. The geology of the Moon is quite different from that of Earth. The Moon lacks a significant atmosphere, which eliminates erosion due to weather; it does not have any form of plate tectonics, it has a lower gravity, and because of its small size, it cooled more rapidly. The complex geomorphology of the lunar surface has been formed by a combination of processes, especially impact cratering and volcanism. The Moon is a differentiated body, with a crust, mantle, and core. Komatiite is a type of ultramafic mantle-derived volcanic rock. Komatiites have low silicon, potassium and aluminium, and high to extremely high magnesium content. Komatiite was named for its type locality along the Komati River in South Africa. Picrite basalt, picrobasalt is a variety of high-magnesium olivine basalt that is very rich in the mineral olivine. It is dark with yellow-green olivine phenocrysts and black to dark brown pyroxene, mostly augite. The tholeiitic magma series, named after the German municipality of Tholey, is one of two main magma series in igneous rocks, the other being the calc-alkaline series. A magma series is a chemically distinct range of magma compositions that describes the evolution of a mafic magma into a more evolved, silica rich end member. The International Union of Geological Sciences recommends that tholeiitic basalt be used in preference to the term "tholeiite". The calc-alkaline magma series is one of two main subdivisions of the subalkaline magma series, the other subalkaline magma series being the tholeiitic. A magma series is a series of compositions that describes the evolution of a mafic magma, which is high in magnesium and iron and produces basalt or gabbro, as it fractionally crystallizes to become a felsic magma, which is low in magnesium and iron and produces rhyolite or granite. Calc-alkaline rocks are rich in alkaline earths and alkali metals and make up a major part of the crust of the continents. Pilot Knob is the eroded core of an extinct volcano located 8 miles (13 km) south of central Austin, Texas, near Austin-Bergstrom International Airport and McKinney Falls State Park. Lava is molten rock generated by geothermal energy and expelled through fractures in planetary crust or in an eruption, usually at temperatures from 700 to 1,200 °C. 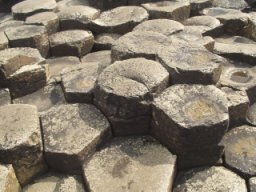 The structures resulting from subsequent solidification and cooling are also sometimes described as lava. The molten rock is formed in the interior of some planets, including Earth, and some of their satellites, though such material located below the crust is referred to by other terms. Volcanology of Northern Canada includes hundreds of volcanic areas and extensive lava formations across Northern Canada. The region's different volcano and lava types originate from different tectonic settings and types of volcanic eruptions, ranging from passive lava eruptions to violent explosive eruptions. Northern Canada has a record of very large volumes of magmatic rock called large igneous provinces. They are represented by deep-level plumbing systems consisting of giant dike swarms, sill provinces and layered intrusions. São Tomé and Príncipe both formed within the past 30 million years due to volcanic activity in deep water along the Cameroon line. Long-running interactions with seawater and different eruption periods have generated a wide variety of different igneous and volcanic rocks on the islands with complex mineral assemblages. ↑ "Basalt". USGS Volcano Hazards program – Glossary. USGS. 8 April 2015. Retrieved 27 July 2018. ↑ "Basalt". Geology: rocks and minerals. The University of Auckland. 2005. Retrieved 27 July 2018. ↑ "USGS: Volcano Hazards Program". U.S. Geological Survey. 2018. Retrieved 8 February 2018. ↑ LE BAS, M. J.; STRECKEISEN, A. L. (1991). "The IUGS systematics of igneous rocks". Journal of the Geological Society. 148 (5): 825–833. Bibcode:1991JGSoc.148..825L. CiteSeerX 10.1.1.692.4446 . doi:10.1144/gsjgs.148.5.0825. ↑ "Rock Classification Scheme - Vol 1 - Igneous". British Geological Survey: Rock Classification Scheme. 1: 1–52. 1999. ↑ "CLASSIFICATION OF IGNEOUS ROCKS". Archived from the original on 30 September 2011. ↑ Harper, Douglas. "basalt (n.)". Online Etymology Dictionary. Retrieved 4 November 2015. ↑ Pliny the Elder, Naturalis Historiae. Book 36, section 11 (Loeb Classical Library): "The Egyptians also discovered in Ethiopia what is called basanites, a stone which in colour and hardness resembles iron: hence the name they have given it." This stone is now believed to have been greywacke, a sedimentary rock unrelated to basalt. ↑ Hyndman, Donald W. (1985). Petrology of igneous and metamorphic rocks (2nd ed.). McGraw-Hill. ISBN 978-0-07-031658-4. ↑ Blatt, Harvey & Robert Tracy (1996). Petrology (2nd ed.). Freeman. ISBN 978-0-7167-2438-4. ↑ Condie, Kent C. (1997). "Chapter 3: "Tectonic settings"". Plate Tectonics and Crustal Evolution. Butterworth-Heinemann / Elsevier. p. 69. ISBN 978-0-7506-3386-4. ↑ KUSHIRO, Ikuo (2007). "Origin of magmas in subduction zones: a review of experimental studies". Proceedings of the Japan Academy, Series B. 83 (1): 1–15. Bibcode:2007PJAB...83....1K. doi:10.2183/pjab.83.1. ISSN 0386-2208. ↑ Ozerov, Alexei Y (January 2000). "The evolution of high-alumina basalts of the Klyuchevskoy volcano, Kamchatka, Russia, based on microprobe analyses of mineral inclusions". Journal of Volcanology and Geothermal Research. 95 (1–4): 65–79. Bibcode:2000JVGR...95...65O. doi:10.1016/S0377-0273(99)00118-3. ↑ Hofmann, A. W. (21 October 2014). "3.3 – Sampling Mantle Heterogeneity through Oceanic Basalts: Isotopes and Trace Elements". In Carlson, Richard W. The Mantle and Core. Treatise on Geochemistry. 3. Elsevier B.V. pp. 67–101. doi:10.1016/B978-0-08-095975-7.00203-5. ISBN 978-0-08-098300-4. ↑ Weaire, D.; Rivier, N. (20 August 2006). "Soap, cells and statistics—random patterns in two dimensions". Contemporary Physics. 25 (1): 59–99. Bibcode:1984ConPh..25...59W. doi:10.1080/00107518408210979. ↑ Edwards, Katrina J.; Bach, Wolfgang; Rogers, Daniel R. (April 2003). "Geomicrobiology of the Ocean Crust: A Role for Chemoautotrophic Fe-Bacteria". Biological Bulletin. 204 (2): 180–185. doi:10.2307/1543555. JSTOR 1543555. PMID 12700150 . Retrieved 4 November 2015. ↑ Templeton, Alexis S.; Staudigel, Hubert; Tebo, Bradley M. (April 2005). "Diverse Mn(II)-Oxidizing Bacteria Isolated from Submarine Basalts at Loihi Seamount". Geomicrobiology Journal. 22 (3–4): 127–139. doi:10.1080/01490450590945951. ↑ Lopes, Rosaly M. C.; Gregg, Tracy K. P. (2004). Volcanic Worlds: Exploring The Solar System's Volcanoes. Springer-Praxis. p. 135. ISBN 978-3-540-00431-8. ↑ Bhanoo, Sindya N. (28 December 2015). "New Type of Rock Is Discovered on Moon". The New York Times . Retrieved 29 December 2015. ↑ Giguere, Thomas .A. ; Taylor, G. Jeffrey; Hawke, B. Ray; Lucey, Paul G. (2000). "The titanium contents of lunar mare basalts". Meteoritics & Planetary Science. 35: 193–200. doi:10.1111/j.1945-5100.2000.tb01985.x. ↑ Grotzinger, J. P. (26 September 2013). "Analysis of Surface Materials by the Curiosity Mars Rover". Science. 341 (6153): 1475. Bibcode:2013Sci...341.1475G. doi:10.1126/science.1244258. PMID 24072916. ↑ Hance, Jeremy (5 January 2010). "Underwater rocks could be used for massive carbon storage on America's East Coast". Mongabay. Retrieved 4 November 2015. Alexander Ablesimov, N. E.; Zemtsov, A. N. (2010). Релаксационные эффекты в неравновесных конденсированных системах. Базальты: от извержения до волокна[Relaxation effects in nonequilibrium condensed systems. Basalts from eruption to fiber] (in Russian). Moscow. Francis, Peter; Oppenheimer, Clive (2003). Volcanoes (2nd ed.). Oxford: Oxford University Press. ISBN 978-0-19-925469-9. Gill, Robin (2010). Igneous rocks and processes : a practical guide. Chichester, West Sussex, UK: Wiley-Blackwell. ISBN 978-1-4443-3065-6. Hall, Anthony (1996). Igneous petrology. Harlow: Longman Scientific & Technical. ISBN 9780582230804. Alexander V. Sobolev; Albrecht W. Hofmann; Dmitry V. Kuzmin; Gregory M. Yaxley; Nicholas T. Arndt; Sun-Lin Chung; Leonid V. Danyushevsky; Tim Elliott; Frederick A. Frey; Michael O. Garcia; Andrey A. Gurenko; Vadim S. Kamenetsky; Andrew C. Kerr; Nadezhda A. Krivolutskaya; Vladimir V. Matvienkov; Igor K. Nikogosian; Alexander Rocholl; Ingvar A. Sigurdsson; Nadezhda M. Sushchevskaya & Mengist Teklay (20 April 2007). "The Amount of Recycled Crust in Sources of Mantle-Derived Melts" (PDF). Science. 316 (5823): 412–417. Bibcode:2007Sci...316..412S. doi:10.1126/science.x (inactive 2018-09-11). PMID 17395795. Siegesmund, Siegfried; Snethlage, Rolf, eds. (2013). Stone in architecture properties, durability (3rd ed.). Springer Science & Business Media. ISBN 978-3662100707. Young, Davis A. (2003). Mind over magma : the story of igneous petrology. Princeton, N.J.: Princeton University Press. ISBN 978-0-691-10279-5. Wikisource has the text of the 1911 Encyclopædia Britannica article Basalt .